The Blue Grotto is essentially an open cave or arch which leads to a series of caves of incredible colour and reflected lights, on the south west side of Malta near the town of Zurrieq. 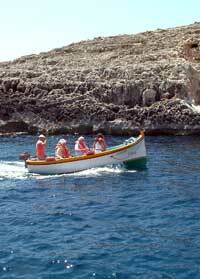 You can only get to the Blue Grotto by boat from the visitor centre. The boats sail under an arch that is almost 50 metres high to enter the limestone caves where lght reflecting off the cave walls creates an amazing mix of colours and reflections. The sea is an incredible cobalt blue colour because of the depth and the sandy bottom. Tickets for the boats can be purchased from a booking office near the base of the cliffs. There are some very good facilities for visitors including a car park, cafes, shops, souvenir shops, toilets and a small park. All around the cove where the boats leave from are ledges of limestone rock for sunbathing. The views from the cliffs are stunning, the landscape peppered with prickly pear and mauve mats of thyme. We would recommend a drive around the coats in south west Malta for the fabulous sea views, wild flowers and lookout towers built by the medieval knights. 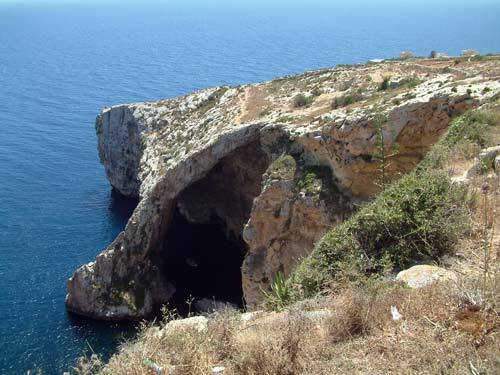 Some scenes from the film Troy, starring Brad Pitt , were filmed at the Blue Grotto.